It’s time for some more public service announcements from around Biffordshire. It’s always time for some more public service announcements from around Biffordshire at Monkeybroth Towers. That’s cos we love them and you, dear readers. We love you more than we love crumpets. We love you more than we love Virgil, the guy who fixes the fax machine for us. Virgil loves a crumpet or two! FAMILIES. Looking for a fun day out only part of the family will enjoy? The 13th Annual Mumford Otter and Cheese Show promises just that. Highlights for the Saturday include Mumford Otter Show-Off group’s performance of their hilarious rendition of Oh What a Lovely Otter, while later in the day, you’ll be able to play Asian Otter or Gorgonzola! over by the cheese-shaped Ferris wheel. Plus, don’t miss a fabulous display by the Red Arrows which, for this event only, will be piloted by otters eating Red Leicester! How apt! Please note that due to foreseen circumstances, the Cirque d’Otter will not be performing at this year’s event due to a suspicious phone call to be received in the week leading up to the event. It will sound like someone’s eating crisps on the other end of the line, but they won’t be. For more details call Tulip Sunrise on Mumford 433232111. FLOWERS Have small CCTV cameras in them linked to hell. The devil uses them to watch you. Issued by the Royal Anti-Horticultural Society of Great Britain. FOUND. I’ve found my cat, Mrs Tinkle. Thanks to everyone who got in touch to help me find her. Particular thanks go to RAF Biffordshire Tornado Squadron who managed to shoot Mrs Tinkle down over Berkshire as she attempted to strafe Windsor Castle. I’m so embarrassed. I honestly thought her having a pilot’s licence would give her an interest and get her out of the house. RHODENDRON BUSHES – are wigs for the devil’s demons, allowing them to go incognito and spy on you as you get undressed at bedtime. Issued by the Royal Anti-Horticultural Society of Great Britain. Protecting his Nan. Like a boss. Anywayz, I been staying at me nans, Cha-Cha Pig, lookin’ after her and keepin’ her nice. She does a royal Sunday lunch wiv all the trimmings so life is sweeeeet! She been havin’ some trouble wiv da local hoofs comin’ around her manor and tearing up her begonias. 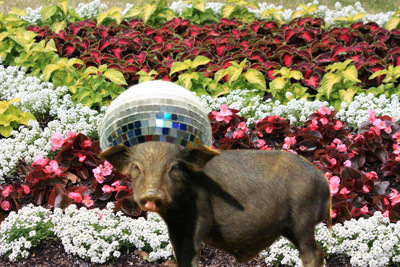 Disco Pig be all up in their face and stuff and teachin’ dem some manners. Unfortunate for Disco Pig, dey go and call up their brothers and, before I know it, da whole Aston Clinton massive be all over Disco Pig like a moth to honey! Me? I got outta there man! Da Pig knows what good for him ya know! Anyway, check out the total quality on dis selection of top beats! TUUUUNZ and naaaa fillaaaaa! Grimlock Ft. Spade of Bass – Get me to Winchester and the people will be freed! Frankie goes to Pinewood – Seriously, just calm down ok? Some feet. Yes, those are feet. Run like the neighbour’s cat cat cat!